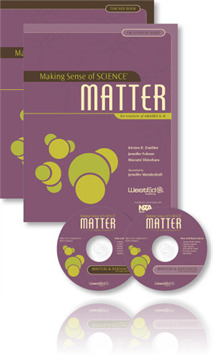 Teacher Book with teaching, science, and literacy investigations, along with a follow-up component, Looking at Student Work™, designed to support ongoing professional learning communities CD with black line masters of all handouts and charts to support group discussion and sense making, course participation certificates, student work samples, and other materials that can be reproduced for use with teachers Charts that serve as a focal point for teacher learning during the course as well as additional Teacher Books can be purchased separately. Also available are Facilitation Academies designed to prepare staff developers, district science leaders, and other teacher educators to effectively lead Making Sense of SCIENCE courses. For more information about Making Sense of SCIENCE courses and Facilitation Academies, visit the Making Sense of SCIENCE website.